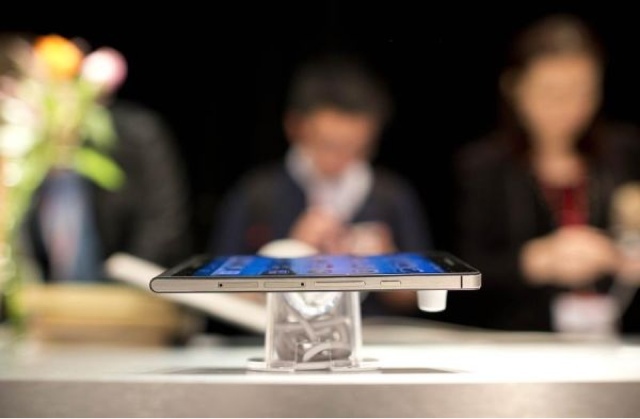 China's Huawei unveiled its flagship smartphone, the Ascend P6, at its first standalone launch event in London this week, underlining its ambitions to compete with Apple and Samsung in the top tier of mobile technology. The company says the device, at 6.18mm thick, is the world's slimmest. It has a 5-megapixel front-facing camera, designed for taking "selfies", or pictures of the owner to be shared on social media networks. The company picked the launch date - 6/18 (June 18) - to tie in with the smartphone's dimensions. The launch, at an arts venue in North London, takes a cue from Apple and Samsung, both of which have made new product announcements at high profile events for a number of years. Previously Huawei unveiled its handsets at industry trade shows like Mobile World Congress in Barcelona. Huawei, which also makes telecom networking gear, is looking to drive sales of its consumer devices, a sector in which it has only had its own brand for about three years. The company was the fourth-largest maker of smartphones in the first quarter of 2013, trailing LG Electronics and the two dominant brands Apple and Samsung, according to analyst firm Gartner. The top two sold more than 100 million units between them, while LG sold 10 million and Huawei 9 million, most of which were in its native China. The Ascend P6 uses Huawei's customised version of Google's Android operating system. Industry analyst Ben Wood at CCS Insight said that at the right price the Ascend P6 would attract buyers who had not considered Huawei before. The device is not, at this stage, compatible with the high speed, next generation 4G networks, which are being rolled out across the world. an endless competition, both to the manufactures and the users.